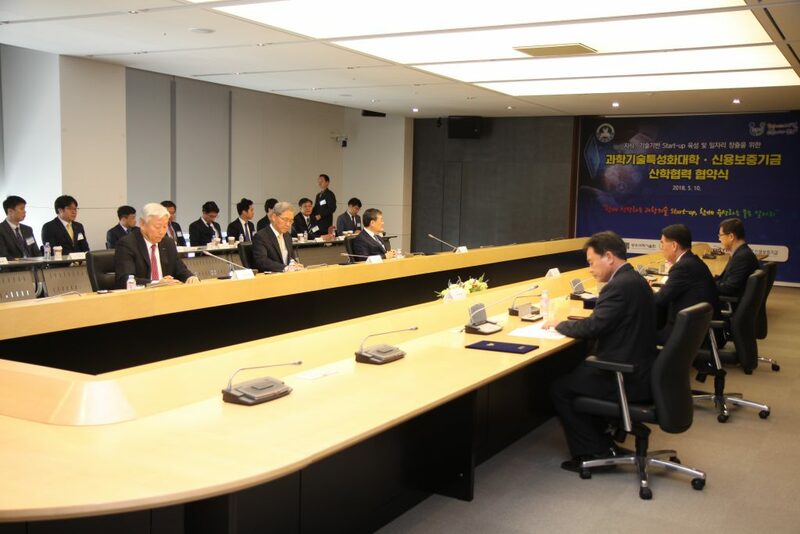 The signing ceremony on cooperation agreement among UNIST, KAIST, GIST, DGIST, POSTECH, and KODIT was held on Thursday, May 10, 2018. 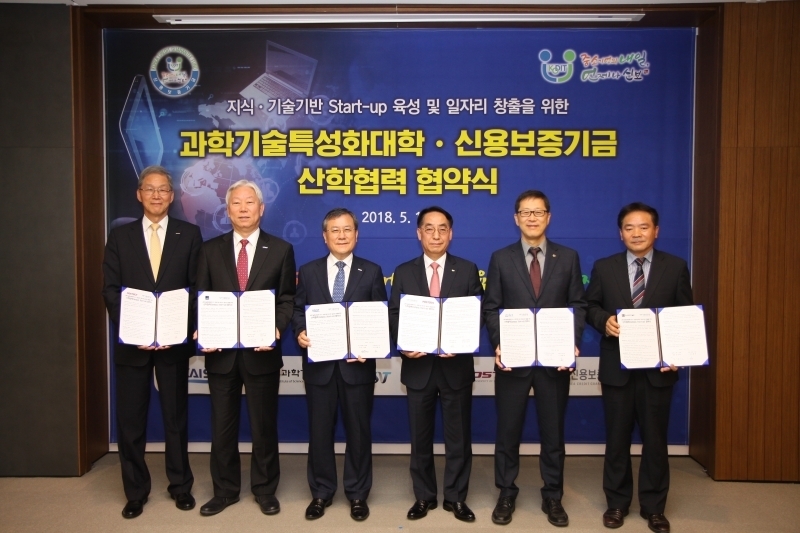 Five of the nation’s preeminent research institutions (UNIST, KAIST, GIST, DGIST, POSTECH) have signed a memorandum of understanding (MOU) with Korea Credit Guarantee Fund (KODIT), forging a new partnership to deliver new career opportunities. The signing ceremony for this Industry-Academia cooperation agreement was held at the headquarter of KODIT on Thursday, May 10, 2018. The primary purpose of this agreement is to provide support for innovative and pioneering startups and to promote commercialization of exceptional R&D results delivered by each university, which in turn leads to more career opportunities in science and technology. With the help of KODIT, the above five organizations will identify innovative startups and support them with both financial and non-financial benefits. In addition, they plan on hosting startup conferences on a regular basis to promote the activation of startup businesses through mutual cooperation. The signing ceremony of Industry-Academia collaboration MoU, held at the headquarter of KODIT in Deagu. The Korea Credit Guarantee Fund plans to offer up to KRW 6 billion in credit guarantees, investments, and consulting for those exceptional startups that are recommended by the above organizations through ‘Campus Start-up Guarantee’ without a joint surety. In addition to the financial and non-financial supports, KODIT will also provide the following other benefits, such as guarantee fee discount rate by 0.3%, 90% preferential guaranteed rate, and credit check fee waiver for the next five years. Established in May 2017, the ‘Campus Start-up Project’ is a joint project among 40 startup leading universities, including Seoul National University and Korea University to spread the spirit of entrepreneurship and expand startups in the university. The project has provided a total of KRW 642 billion in credit guarantees to about 130 prominent startup companies.